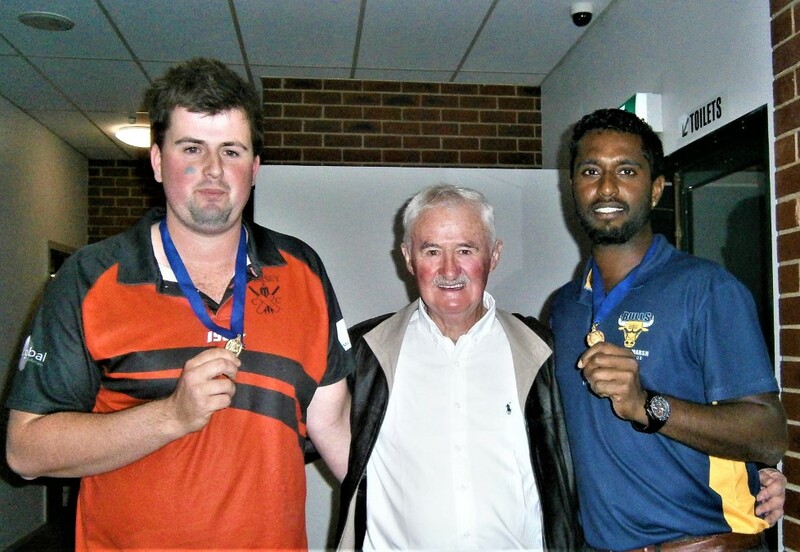 Joint winners: Romsey all-rounder Taylor Stevenson (left) and Bacchus Marsh speedster Madushanka Ekanayaka shared the top individual award In McIntyre Cup cricket for 2018-19, and were presented with their medals by the legendary Kevin Sullivan (centre). 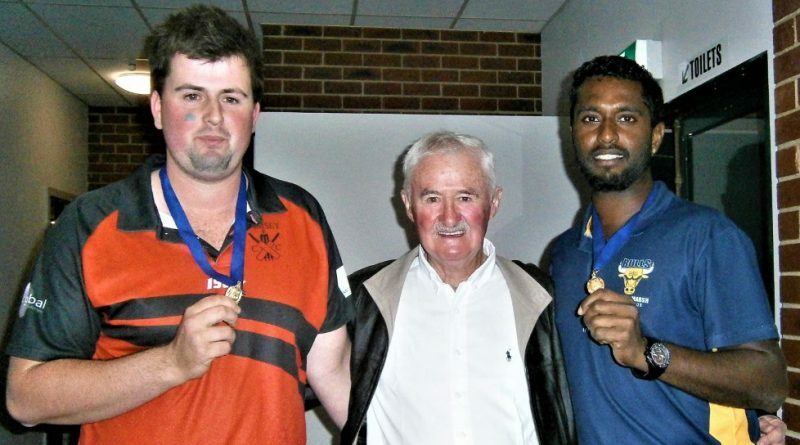 A magnificent 125 runs in Gisborne Cricket Association’s final home and away round enabled Romsey’s Taylor Stevenson to gain maximum votes to share the prestigious Sullivan Medal with Bacchus Marsh speedster Madushanka Ekanayaka. The dramatic vote count for the top individual award took place at the GDCA’s presentation night held at Sunbury Bowling Club last Wednesday evening. The 24 year-old Stevenson enjoyed a fine 2018-19 season with bat and ball in McIntyre Cup, whether opening or batting down the order, and bowling his economical off-spinners. Ekanayaka, a Sri Lankan who has starred with Bacchus Marsh for the last three seasons, captured 39 wickets and made over 200 runs. He just missed out on the medal last season, when Romsey’s Ben Way and Riddell fast bowler Matt Livingstone tied with 19 votes. Stevenson becomes the third Romsey player to win the medal, with Way (twice) and Chris Burkett also having achieved this distinction in the last four seasons. This time 15 votes was sufficent to win the medal, and plenty of contenders were in the mix with two rounds to play. Young Bacchus Marsh opener Alex Porter finished with 13 votes, Gisborne’s all-rounder Jakson Knight and paceman Recordo Gordon tied on 12, Way finished with 11, and Burkett, Kieran Atkin (Wallan), Jarryd Vernon (Gisborne) and Upul Fernando (Diggers Rest-Bulla) each received 10. Presenting the two medals, GDCA life member Kevin Sullivan reflected on the qualities of the joint winners. He described Ekanayaka as a “premier bowling all-rounder”, and said Stevenson has enjoyed a fantastic season. Stevenson’s father, Alan, was an outstanding player for Macedon Cricket Club for a long period. “Cricket’ a great game,” Sullivan said, with a special reference to former medal winners in Steven Paterson (three) and Heath Wadden now playing with their sons in a lower grade at Riddell. Premiers in the various grades were presented with cups, and GDCA president Rob McIntyre thanked all clubs for their efforts over the season. Porter took out the McIntyre Cup batting award, Ekanayaka the bowling award, and Ben Way the aggregate with 773 points. Bacchus Marsh won the McIntyre Cup for the second season in succession, beating Gisborne in the final by six wickets. 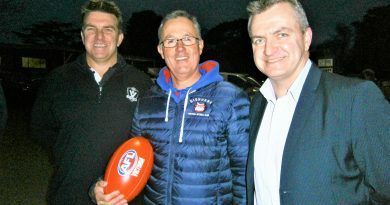 Johnstone Cup winners St Anthony’s will be promoted replacing Wallan in McIntyre Cup next season, and the Melton-based club will be looking for some key players to make sure it is competitive in the top grade. 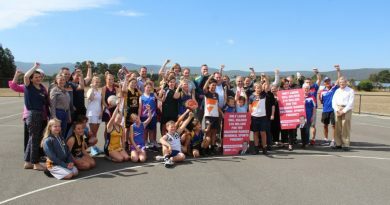 One of the season highlights for the GDCA was the victory in the Kenmac Shield, beating the strong Ballarat and Bendigo association’s in the process. Chloe Stewart. 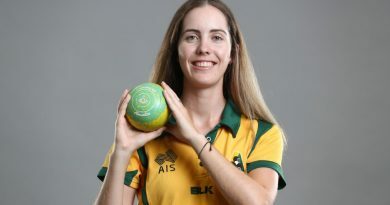 Photo: Bowls Australia.